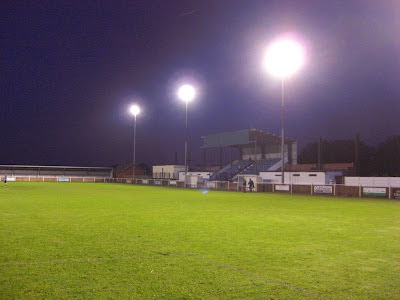 My fifth stadium of 2011 was on Tuesday 1st February 2011 at Broad Lane in Wivenhoe, Essex. The match was Wivenhoe Town vs. Felixstowe & Walton United in the Ridgeons Eastern Counties League Premier Division. The Broad Lane ground is 1.5 miles from Wivenhoe railway station and sits out in the fields to the north of the town of Wivenhoe. The venue has been home to Wivenhoe Town since 1978. The main stand is located on the south side of the ground, level with the half-way line. This structure is able to provide seating for around 170 fans with the remainder of this side of the ground taken up by uncovered standing areas on raised concrete. When I visited the stadium there was an additional all-seater stand opposite this on the north side of the venue which could hold another 130 fans. However, this has now been demolished meaning this side now just consists of uncovered standing. The two stands behind the goal at the eastern and western ends of the ground are similar in nature. Both are covered standing on raised concrete with chairs occasionally placed out for those who wish to sit. The area behind the stand at the western end of the ground also contains the stadium entrance as well as the players dressing rooms and other club facilities. The game saw two sides struggling in the league compete to pull clear of trouble and it turned out to be a relatively comfortable victory for Felixstowe & Walton United. The opening goal came into the 22nd minute when a Felixstowe shot was saved by the Wivenhoe goalkeeper only for the ball to bounce back off a home defender and into the net. After this Wivenhoe begun to come back into the game but they were restricted to speculative efforts and did not really look like scoring. The visitors on the other hand continued to appear dangerous and wrapped up the fixture in the 89th minute when a passing move was finished off in the six yard box when a shot was rifled into the roof of the net. The final whistle was blown shortly after with Felixstowe & Walton United recording a deserved 2-0 victory over the disappointed home side.